See also Tambourine (disambiguation), tamborim and timbrel. "Buben" redirects here. For the "Buben group" of Soviet spies, see Louis F. Budenz. The tambourine is a musical instrument in the percussion family consisting of a frame, often of wood or plastic, with pairs of small metal jingles, called "zills". Classically the term tambourine denotes an instrument with a drumhead, though some variants may not have a head at all. Tambourines are often used with regular percussion sets. They can be mounted, for example on a stand as part of a drum kit (and played with drum sticks), or they can be held in the hands and played by tapping or hitting the instrument. High sound of jingles, plus some have a skin with a lower sound. Tambourines come in many shapes with the most common being circular. It is found in many forms of music: Turkish folk music, Greek folk music, Italian folk music, classical music, Persian music, samba, gospel music, pop music, country music, and rock music. Tambourines originated in Egypt, where they were known as the tof to the Hebrews, in which the instrument was mainly used in religious contexts. The word tambourine finds its origins in French tambourin, which referred to a long narrow drum used in Provence, the word being a diminutive of tambour "drum," altered by influence of Arabic tunbur "drum". from the Middle Persian word tambūr "lute, drum". Ancient Greek black-figure pottery depicting a girl playing the tambourine. Bourgas Archaeology Museum. Girl playing a tambourine. Detail from Recreation (1896), by Charles Sprague Pearce. Library of Congress Thomas Jefferson Building, Washington, D.C.
An advanced playing technique is known as the thumb roll. The finger or thumb is moved over the skin or rim of the tambourine, producing a fast roll from the jingles on the instrument. This takes more skill and experience to master. The thumb or middle finger of the hand not holding the tambourine is run around the head of the instrument approximately one centimeter from the rim with some pressure applied. If performed correctly, the thumb should bounce along the head rapidly, producing the roll. Usually, the end of the roll is articulated using the heel of the hand or another finger. In the 2000s, the thumb roll may be performed with the use of wax or resin applied to the outside of the drum head. This resin allows the thumb or finger to bounce more rapidly and forcefully across the head producing an even sound. A continuous roll can be achieved by moving the thumb in a "figure of 8" pattern around the head. By lead singers who shake it while they play – Lead singers such as Mick Jagger, Freddie Mercury, George Michael, Mike Love, Jon Anderson, Jim Morrison, Robert Plant, Peter Gabriel, Liam Gallagher, Gene Clark, Ray Thomas, Trent Reznor, Ian Astbury, Stevie Nicks, Roger Daltrey, Jon Davison, Tyler Joseph, Gerard Way, Florence Welch, Tim Booth, Taylor Momsen, Davy Jones, Nico and Ryan Tedder have all been known to use a tambourine while singing. Tambourines in rock music are most often headless, a ring with jangles but no drum skin. The Rhythm Tech crescent-shaped tambourine and its derivatives are popular. The original Rhythm Tech tambourine is displayed in the Museum of Modern Art. Jack Ashford's distinctive tambourine playing was a dominant part of the rhythm section on Motown records. The tambourine was featured in "Green Tambourine", a busking-oriented song with which The Lemon Pipers, a 1960s musical group, notched a chart selection. Wolfgang Amadeus Mozart was among the earliest western composers to include the tambourine in his compositions. Since the late eighteenth century it has become a more permanent element of the western orchestral percussion section, as exemplified in some of Pyotr Ilyich Tchaikovsky's dance pieces from The Nutcracker Suite. Gustav Holst's seven-movement orchestral suite The Planets also features the tambourine in several places throughout the suite, especially in the "Jupiter" movement. Buben (Бубен in Russian, Бубон in Ukrainian, boben in Slovenian, buben in Czech, bęben in Polish) is a musical instrument of the percussion family similar to a tambourine. A buben consists of a wooden or metal hoop with a tight membrane stretched over one of its sides (some bubens have no membrane at all). Certain kinds of bubens are equipped with clanking metal rings, plates, cymbals, or little bells. It is held in the hand and can be played in numerous ways, from stroking or shaking the jingles to striking it sharply with hand. It is used for rhythmical accompaniment during dances, soloist or choral singing. Buben is often used by some folk and professional bands, as well as orchestras. The name is related to Greek language βόμβος (low and hollow sound) and βομβύλη (a breed of bees) and related to Indo-Aryan bambharas (bee) and English bee. Buben is known to have existed in many countries since time immemorial, especially in the East. There are many kinds of bubens, including def, daf, or qaval (Azerbaijan), daf or khaval (Armenia), daira (Georgia), doira (Uzbekistan and Tajikistan), daire or def (Iran), bendeir (Arab countries), pandero (Spain). In Kievan Rus, drums and military timpani were referred to as buben. A daf is a large-sized tambourine used to accompany both popular and classical music in Iran, Azerbaijan, Turkey (where it is called tef), Uzbekistan (where it's called childirma), India (where it is known as the Dafli) and Turkmenistan. Daf typically indicates the beat and tempo of the music being played, thus acts like the conductor in the monophonic oriental music. The Persian poet Rudaki, who widely used names of the musical instruments in his poems, mentions the daf and the tambourine (taboorak) in a Ruba'i: A common use of tambourine (Daf) is by Albanians. They are often played by women and bridesmaids in wedding cases to lead the ceremony when bride walks down the aisle. The Basque pandero is a folk instrument currently played along with the diatonic accordion in a duo most of the times. Sometimes the players, who play in festivities to enliven the atmosphere or less frequently at onstage performances, sing along. At times the pandero accompanies the alboka or txistu too. Yet these kinds of duos have not always been the case. As attested in 1923, the youth gathered to dance to the rhythm of the bare pandero, with no other music instrument implicated but the player's (a woman's) voice. The riq (also spelled riqq or rik) is a type of tambourine used as a traditional instrument in Arabic music. It is an important instrument in both folk and classical music throughout the Arabic-speaking world. Widely known as "Shakers". Ta'r, Egypt, picture p.366 in Edward William Lane (1860) . An Account of the Manners and Customs of Modern Egyptians (5th ed.). Deff - Tambourine, Palestine, picture p. 579 in W. M. Thomson: The Land and the Book; or Biblical Illustrations Drawn from the Manners and Customs, the Scenes and Scenery of the Holy Land. Vol. II. New York, 1859. 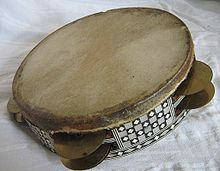 Tar (Arabic: طار‎) is a single-headed frame drum of Turkish origin, but is commonly played in North Africa and the Middle East. Redep, a rebana from Palembang, South Sumatra, with its typical red, black, and gold color. One or more of the preceding sentences incorporates text from a publication now in the public domain: Schlesinger, Kathleen (1911). "Timbrel" . In Chisholm, Hugh (ed.). Encyclopædia Britannica (11th ed.). Cambridge University Press. ^ "tambourine | Origin and meaning of tambourine by Online Etymology Dictionary". www.etymonline.com. Retrieved 2018-02-26. ^ "tabor | Origin and meaning of tabor by Online Etymology Dictionary". www.etymonline.com. Retrieved 2018-02-26. ^ Brinkworth, Jayson (2 March 2010). "The Almighty Tambourine". The Black Page. Retrieved 5 November 2012. Wikimedia Commons has media related to Tambourine. "Tambourine" . Encyclopædia Britannica (11th ed.). 1911. "Tambourine" . The New Student's Reference Work . 1914.